Hello Families and First Graders! I am very excited about having all of you in my classroom this year. I would like to welcome all of you to an interesting, challenging and fun year of learning. We will be learning about lots of cool things along with becoming a better reader, writer and mathematician. We will also be learning interesting health, science, and social studies concepts. I know we will all have a great year of growing socially and academically together. I am very excited about having you as part of our learning team. When I say team, I am talking about the student, the parents, and of course me. We will be working closely together to help make this year of school a happy, pleasant, safe and productive one for your child. This year in First Grade we will be learning about lots of new and interesting things. We will all become great readers and writers together. The most important thing you can do to help yourself become a good reader is to practice reading every single night. It is also very important to reread stories several times. This will help to make all those words in the story become automatic sight words. 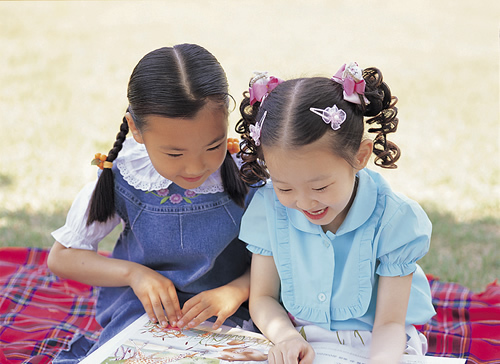 Reading with a friend makes reading even more fun! I welcome parent volunteers that would like to come in and work in the classroom. If you are interested in volunteering just let me know when you would like to come in and we will work out a schedule. Before you can start it will be necessary for you go to the Mt. Pleasant Public Schools website and fill out a volunteer background check. It takes about a week for it to clear so plan ahead. If you do not reach me leave a message and I will get back with you as soon as I'm able. Again Welcome to Room 206 and the First Grade!